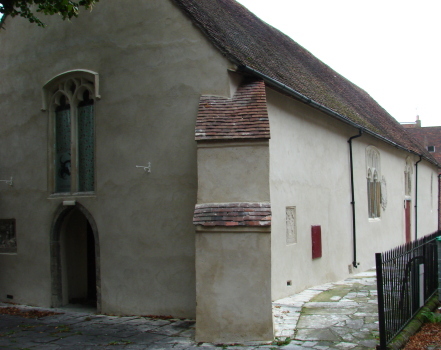 The walls are obscured by render, but are C13 or older. Most windows were inserted in the C14 and C15. It is now an arts centre. When built, the church stood in an intricate system of alleys, but today stands by a car park. It is plain and rectangular with no divide between nave and chancel. The date of the thickly rendered walls is hard to guess. However, the lancets at the eastern end of each side show it had reached its present size by the C13 and excavations have indicated that the western nave and western chancel may be older (1 p10). Under the render, the north and south doorways appear to be C13. The east triplet in the chancel is C19 – Adelaide Tracy (I 65) (1852) shows a four-light east window with panelled tracery. This looks late C14, like the existing pointed two-light windows in each side-wall, with straight-sided hexagons in the heads, the pointed west doorway and possibly the curious segmental window above, with a quatrefoil squeezed in below the head; though renewed, its predecessor was thought to be C14 (Fleming p16). The small, boarded belfry with a shingled spirelet may belong to the same period. It has supports inside and the massive diagonal west buttresses may have been added to stabilise it. They are not bonded into the earlier west corners and though the VCH (3 p161) calls them ‘modern’, they appear on the Sharpe Collection drawing (1804). The two side windows with segmental heads and panelled tracery look C15. In 1856 a planned gabled north aisle, designed by T Rassell (WSRO Par 37/4/1), would have doubled the number of places, but encountered opposition in the parish (ICBS) and was not built. 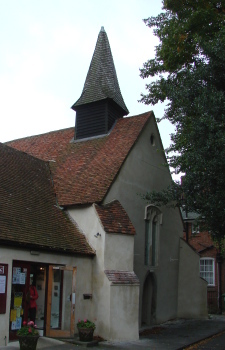 Though the proposal was revived in 1866 (2 p16), only minor repairs were carried out (WSRO Par 37/4/2), with a new vestry, probably some windows and the boarding of the roof. According to the VCH in 1935, the east triplet had been erected ‘in recent years’ (3 p161) and in that year money for repairs was being collected (WSRO ibid). After war damage in 1943, the church stood empty until it became an arts centre in 1976, when new structures were added to the north. One has a flat roof, the other, added in 1989, a double gable. In 2004 there were plans to replace the former (Cornerstone 25 (Dec 2004) p22). Since conversion, most fittings have gone, though a west gallery remains. A welcome recent change has been the lime-washing of the previously dingy exterior render. Glass: Some good modern engraved windows with figures by M Taylor, inserted after conversion. 1. (Outside on the west wall) Weathered early C16 monument to a couple, who kneel with their children, adoring the Trinity. It is related to the larger and more ambitious tombs at Westhampnett and elsewhere. 2. 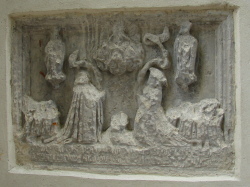 (Outside on the south wall) A smaller but related monument, without children and showing the couple below a figure of the Virgin in a mandorla. 3. (Inside, on the south wall) Tablet in memory of William Collins, poet (d1759). 4. (Now removed to the cathedral) John Cawley (d1621). Painted half-figure under a canopy; the inscription was altered to commemorate his son, also John (d1666), leading to confusion over the dating (e g in BE). 5. Martha Dear (1807?) by H Westmacott. This was brought here from the demolished church of St Martin (Roscoe p1349). 1. (Below both C14 side windows) C14 trefoil-headed, probably connected with the rood or nave altar which would have stood here. 2. (South side at the east end) Similar.